Now that the paint has been removed from the bottom, I’m tackling the most pressing repairs; the boat needs four ribs replaced. 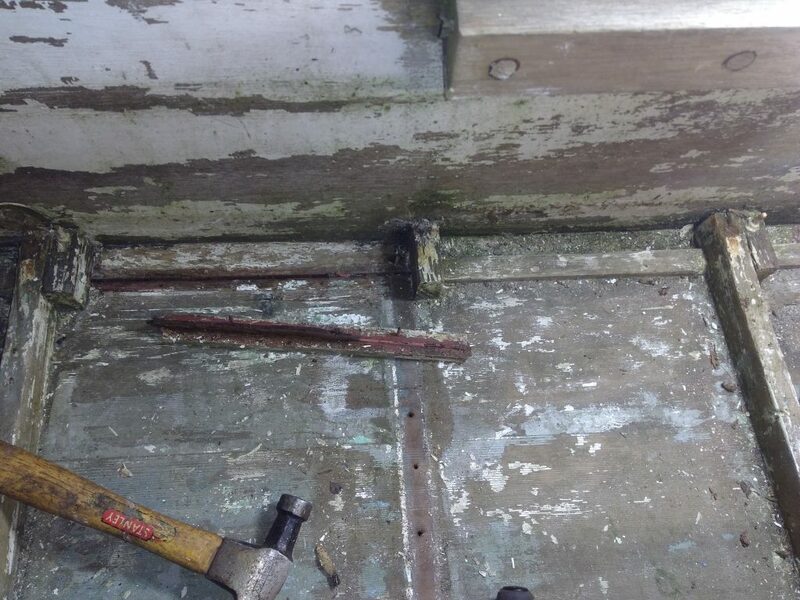 I want to get this taken care of first, so the hull is back to where it needs to be, structurally. I’ve discovered that this boat was fastened with brass hardware, and that some of it has been de-zinced. This is a corrosion process that happens to brass. essentially, saltwater can remove the zinc from the brass alloy, and leaves much weakened and porous copper. It isn’t all of the fasteners, and they seem strong enough to hold if left undisturbed but the heads chew up on some of them when I remove them. After some shopping, I have the oak I need to make the replacement ribs from Crosscut lumber, and a secondhand Delta bandsaw from craigslist to cut them with. At this time, I have removed two of the four ribs i will be replacing. This boat has had these thin pieces of wood aded to back up the garboard seam. the seam has been filled wit ha black rubbery goo, and then patched in places with bathtub silicone. i removed one to inspect, and the hardnened rubbery goo came out in a ridge attached to it. This setup looks like a rot magnet, so i’ll be removing all these pieces and sealing the seam properly. This garboard seam is a bit wide; about 1/8 inch. I’ve also done alot of the mental lofting on the cabin, and the aft flotation bulkhead and after lookign at the old failed mast’s stub and the new mast, i have discovered the boom is set lower on the new mast. to be certain, Before I start templating the cabin I will need to fit the mast and mainsail to measure for clearance. I suspecti may need to either shorten the foot of the sail, or raise the boom.